"LITTLE APPLE," SIZABLE PROJECT: Auth-Florence is taking its 250-employee plant to the Kansas city of Manhattan (pictured), which bills itself with the copyrighted moniker of "the Little Apple." MANHATTAN, Kan.  Auth-Florence's Kansas expansion plans are more than in the mail. They're in the mailbox. One of the leading U.S. manufacturers of commercial and residential mailboxes, Auth-Florence (www.auth-florence.com) is bringing a new $10-million, 250-employee plant to Manhattan, Kan. (www.manhattan.org). The production operation in the northeastern Kansas city of some 45,000 residents marks Auth-Florence's maiden location voyage outside of the Chicago metro, where the company was founded. The site search was broad, however, for the company's first sally outside the Second City, company officials explained at the project announcement in Manhattan. Auth-Florence looked at 56 sites in five Midwest U.S. states, as well as exploring the possibilities of choosing a site in either China or Mexico, company President Dave Dailey explained in Manhattan. "Auth-Florence had a number of options in other states, but ultimately chose Kansas," Lt. Gov. John Moore, who also serves as secretary of the Kansas Department of Commerce and Housing (KDCH at www.kansascommerce.com), said in Manhattan. "This announcement demonstrates that we can and will be successful when the state, through the KDCH, partners with communities like Manhattan to bring outstanding companies and employment opportunities to Kansas." Manhattan's work-force quality, Dailey said, was a major factor in Auth-Florence's decision, as was the area's central U.S. location, which added a distribution edge, he explained. The new 190,000-sq.-ft. (17,100-sq.-m.) plant will be located on a 25-acre (10-hectare) site inside Manhattan's Corporate Technology Park. The 190-acre (76-hectare) park is located next to the Manhattan Regional Airport. "As our business expands, it has become imperative that we find a manufacturing location offering the greatest opportunities for continued success," Dailey said. "Manhattan provided the best choice." Bolstering that choice were state and local incentives, which helped make the Manhattan site "a sound business decision," Dailey explained. The company's incentive agreement with the city of Manhattan includes a 100-percent exemption on all state and local property taxes for the next 10 years. 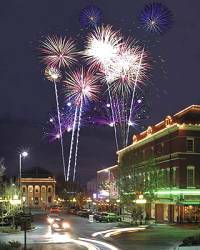 Those tax exemptions will have a value of some $3 million, according to City Manager Ron Fehr. Other city incentives will include $800,000 for road improvements in Corporate Technology Park and $75,000 for Auth-Florence's relocation expenses, Fehr added. A few "key existing personnel" will be transferred from the Chicago area to Manhattan, Dailey said. The plant's other workers, however, will all be local hires, he added. City incentives will also provide Auth-Florence with financial aid for its site and building. The plant will be financed by a $10-million city-sponsored industrial revenue bond, noted Lyle Butler, CEO of the Manhattan Area Chamber of Commerce. The company will also receive a "forgivable loan" of $230,000 for the Corporate Technology Park tract, Fehr said. The KDCH, which worked with the company to identify state sites that met its location requirements, will also provide a number of other incentives, Moore explained. Those incentives, he said, will include work-force training, financial support from the Kansas Economic Opportunity Initiatives Fund and other state tax credits and exemptions that are generally available to companies expanding in the state, he said. Officials didn't estimate the total value of the state's incentives. A "CATALYST" AND A "BLEND": Auth-Florence's manufacturing jobs "will serve as a catalyst to further job creation in the community" and "blend quite nicely to support retail-sector growth," said Manhattan Mayor Ed Klimek. The generous incentive package will pay off for the local economy, officials predicted at the project announcement. "The enhancement of job opportunities is one of our greatest challenges," said Manhattan Mayor Ed Klimek. "We anticipate that the addition of jobs in the manufacturing sector that Auth-Florence brings to Manhattan will serve as a catalyst to further job creation in the community." The expansion will provide a particularly strong boost to the city's retail sector, the mayor added. "The injection of these families into our community will bring new vitality to our school system, which is certainly needed at this time, and to our retail partners, who have made major investments recently," Klimek said. "We need to have the people here and the jobs here to support that retail-sector growth. They blend together quite nicely." Headquartered in Glendale Heights, Ill., Auth-Florence is growing because of its products' emphasis on preventing mail and identity theft, Dailey said. The 69-year-old family-held company, he added, is the only firm in the mailbox industry that's registered to meet ISO 9001 Standards by Underwriters Laboratories. Construction on the new Manhattan plant will begin in March, pending final City Commission approval for the project incentives that Manhattan's government is providing, Dailey said. Plant production will go online in fourth-quarter 2003, he projected, reaching full employment in three years. Some 180 of the plant's 250 jobs will be in production-related functions, including welding, painting and machine operation, Dailey said. The other positions will be in administration, engineering and marketing. 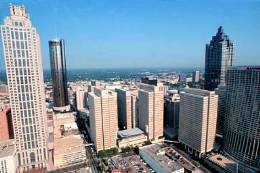 With Newell Rubbermaid, Atlanta (pictured) gains its 13th Fortune 500 headquarters, the third-highest metro total. ATLANTA  Fortune 500 giant Newell Rubbermaid is relocating its headquarters from northwest Illinois to Atlanta  a move driven as much by a shift in organizational philosophy as by traditional location concerns. "The culture of the company has changed radically," Newell Rubbermaid CEO Joseph Galli Jr. said in making the headquarters relocation announcement in Georgia's capital city. "Symbolism is very important. . . . Atlanta is as good as it gets." Newell Rubbermaid's route in getting to Atlanta was a methodical one. Currently based in Freeport, Ill., 117 miles (188 kilometers) west of Chicago, the multi-tentacled conglomerate had been looking for a new headquarters locale for a year and a half, company officials said. The site search spanned a number of major U.S. cities, Galli explained, including Baltimore, Chicago and Dallas. "Several hundred high-end" jobs will be part of the new headquarters complex, he said. And the relocation's long-term ramifications could spur the creation of perhaps 1,000 jobs in Atlanta, Newell Rubbermaid's CEO suggested. Some of that job growth would likely be triggered by Newell Rubbermaid University, which is another part of the relocation  and a major element in the company's efforts to foster a more collaborative corporate culture. "We're going to develop from scratch a corporate training center that will eventually bring thousands to Atlanta," Galli explained. "We believe this new facility will play an important role in preparing our executive team and future company leaders to drive our business to its fullest potential." The new center will feature "breakthrough leadership training," he added. In addition to Atlanta's image of vitality, many of the area's more standard-issue factors attracted Newell Rubbermaid. Customer proximity was one, Galli explained. Three of the company's top customers  Home Depot, Lowe's and Wal-Mart  are headquartered in the U.S. South. The relocation also places Newell Rubbermaid's headquarters closer to some of the company's many business lines, including Atlanta-based Goody Products hair accessories. "Atlanta won," Galli continued, "in a very competitive process with its projected growth, living environment, climate, location and education opportunities." The area's transportation access and reasonable living costs were also factors in Atlanta's favor, he added. "We think we made a terrific decision, and our employees are delighted," Galli said. It remains to be seen, though, exactly where the first wave of headquarters employees will be coming from. The company, Galli said, will initially transfer "about 60" employees from various locations to the Atlanta headquarters, which has a projected opening date of sometime in the second half of 2004. Galli, who lives in Baltimore, said that he will work out of the Atlanta headquarters. He's still undecided about whether to move his home to the Georgia city, he said. Incentives, too, were a significant consideration for Newell Rubbermaid, Galli said. And those subsidies became part of a political wrinkle that gave the company pause before it committed to the relocation. Newell Rubbermaid began its initial negotiations with Georgia with then-Gov. Roy Barnes (D). Unexpectedly, however, Barnes was upset in his November re-election bid by Republican Sonny Perdue. The political shakeup emboldened Atlanta's primary competitors  a group that included several areas that had also negotiated with the company about the relocation. Several suitors turned up the recruiting heat in a late bid to sway Newell Rubbermaid's decision. Perdue's personal reassurances to Galli were a major factor in sealing the deal, according to officials with the Metro Atlanta Chamber of Commerce. Like his predecessor, Perdue confirmed that Newell Rubbermaid would qualify for a $2,500-per-job headquarters relocation tax credit. And, like Barnes, Perdue pledged that he would go to bat with state lawmakers to extend such tax credits to corporate subsidiaries that move to Georgia. Such a tax-credit extension could prove to be a very big factor in creating more Newell Rubbermaid jobs in Atlanta. The company  which makes everything from office products, house wares and hardware to home furnishings and juvenile products  has 26 separate subsidiaries. 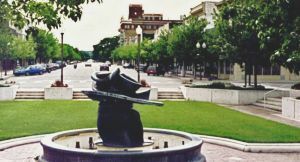 In addition, Georgia pledged as much as $1 million over a two-year period to assist Newell Rubbermaid in developing its headquarters site and infrastructure. The site will be somewhere in North Fulton County, company officials said. Newell Rubbermaid is still deciding between existing facilities and building a new headquarters from scratch. "The Metro Atlanta Chamber worked closely with a team that included the Georgia Department of Industry, Trade & Tourism and the Georgia Power Company to make the case for Atlanta," said Sam Williams, president of the Metro Atlanta Chamber. Despite the headquarters decision, however, the company will retain its 905 employees in Freeport, Newell Rubbermaid officials said. Many corporate administrative functions, including accounting and payroll, will remain in the Illinois city. Newell Rubbermaid, which has 48,000 employees worldwide, currently has 1,800 employees in Illinois. Though it has preserved its cobblestone-sidewalked historic downtown (inset), Alachua has a rural character that provided Wal-Mart with a suitable open site for its new 1.25-million-sq.-ft. (1,125-sq.-m.) distribution center. ALACHUA, Fla.  Wal-Mart has resolved its search for a north-central Florida distribution site: The retail behemoth has picked the small town of Alachua, Fla., for the 600-job, 1.25-million-sq.-ft. (1,125-sq.-m.) project. "You have an ideal location," Wal-Mart Real Estate Director Wiley Lott told local and state officials gathered for the project announcement, held in an open field in southwest Alachua, a city of some 6,700 residents. "We couldn't have picked a prettier spot for a distribution center. "But by far the most important ingredient of picking a site," Lott continued, "is the community and the people. Since I first came up here, I could really sense the spirit of the community." Community spirit, however, wasn't all sweetness and light at the prospect of Wal-Mart's project. Some residents voiced considerable opposition  as is almost always the case with any venture of such vast dimensions. "I've had a lot of sleepless nights to make it to this point," Mayor Bonnie Burgess conceded at the project announcement. Burgess on Feb. 4 cast the deciding vote in the Alachua City Commission's 3-to-2 approval of a memorandum of understanding to exempt the project from a local building moratorium. The agreement also provides for the city to extend utilities to Wal-Mart's site and to apply for state grants to build roads to the distribution center acreage. More than 200 attendees packed the City Commission's meeting in which the Wal-Mart project was under final discussion. The crowd was so large that the commission briefly adjourned to reconvene proceedings inside the larger Alachua Recreation Center. Opponents raised concerns during the meeting over increased truck traffic and diminished quality of life, as well as questioning the project's impact on groundwater quality. At least at the project announcement, however, opposition had significantly dwindled. Only two sign-carrying protestors on Feb. 6 kept a lonely vigil beside a nearby highway. "I am proud to participate in this fine facility, the product of vision and hard work," Burgess said. "We have gone many years in Florida with unsupervised growth. Now we our children and generations afterward will benefit from a merger of community and commercial commitment. That commitment will transcend the immediate and embrace the future." The immediate future, however, will likely still include some spasms of opposition from the City Council. The two members who opposed the project futilely tried before the vote to ascertain the city's expenses in extending utilities to Wal-Mart's site. The information was still being compiled, city officials responded. With Alachua's population of 6,700 residents, Wal-Mart will likely draw part of its 600-employee work force from Gainesville (pictured), a city of some 100,000 residents located 20 miles (32 kilometers) south. The distribution center project happened "way too fast, without enough information," said City Commissioner Tamara Robbins, who voted against the memorandum. The commission, she said, needs project expense totals to properly allocate the city's capital improvement budget. Alachua is already obligated to provide water and sewer service to the area in which Wal-Mart has chosen its site. Wal-Mart initially expressed interest in Alachua in September. That interest came after the company had earlier last year abandoned the idea of locating the center in Marion County after encountering opposition there. 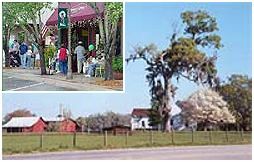 Marion County borders on the south of Alachua County, which is home to the city of Alachua. Enterprise Florida Inc., the state's lead economic development agency, has already determined that the project qualifies for road extensions to the center, according to officials with the Alachua County Council for Economic Outreach. The project also drew the support of the Gainesville, Fla.-based Black Political Consortium. The distribution center will provide the area's poverty-level residents with a living wage, black leaders asserted. In 2000, 22.8 percent of Alachua County residents lived at the poverty level, according to the U.S. Census Bureau. Government leaders are planning to establish a bus route running between the Wal-Mart site in Alachua and Gainesville, a city of approximately 100,000 residents that's located some 20 miles (32 kilometers) south. The new center's 600 jobs will all be full-time positions, with pay levels ranging between $9 and $11 an hour, according to Wal-Mart officials. The Alachua project will sit southwest of the nearby Dollar General distribution center. Construction of Wal-Mart's center, Lott said, is scheduled to start in March 2004, with completion scheduled for spring 2005. The new center will serve Wal-Mart stores in north Florida and south Georgia. Looking for a previous Project Watch? Check the Archive. ©2003 Conway Data, Inc. All rights reserved. Data is from many sources and is not warranted to be accurate or current.